Give Dad what he wants: the gift of clean, shiny paint! When you get a new car, you need new car care supplies! The McKee's 37 New Car Wash Bucket Kit is the perfect way to get everything you need to care for your new ride, without any guesswork. It includes all of the essentials you need to maintain that clean shiny car that you love, and its a great value too, and anyone can appreciate that! 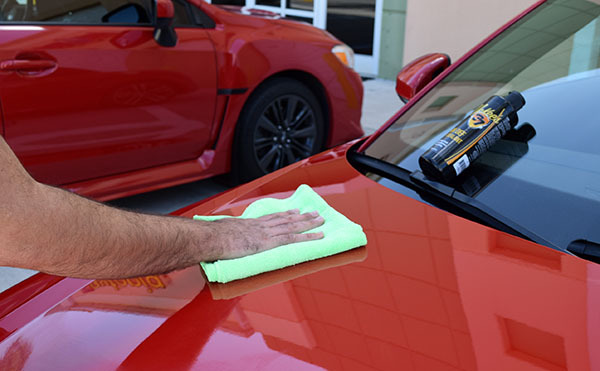 This incredible kit includes a 5 Gallon wash bucket with Grit Guard and Gamma Seal Lid along with six of the most popular McKee's 37 car care formulas, AND a drying towel and wash mitt. It's an amazing value designed to help you properly care for your latest investment! The McKee's 37 5 Gallon Wash Bucket with Grit Guard and Gamma Seal Lid offers three essential accessories that every person needs to wash their car. This perfect trio includes a rugged 5-gallon wash bucket emblazoned with a stylish McKee's 37 logo that shows your level of commitment to car care. This durable bucket is guaranteed not to crack use after use, and includes a Grit Guard that locks dirt and debris in the bottom of the bucket to prevent wash-induced swirl marks. The Gamma Seal Lid is perfect for transporting your favorite wash mixture to car shows and meet ups, making this bucket a must-have for your garage! McKee's 37 5 Gallon Wash Bucket Combo is available exclusively with the patented Gamma Seal Lid for a watertight seal. McKee's 37 Foaming Wheel Cleaner Gel "bleeds" red as it removes embedded brake dust particles. McKee's 37 Power Wash maximizes the performance of foam guns and foam cannons. With a daily driver that's close to 20 feet long, the foam gun paired with the Montana Boar's Hair Car Wash Brush is the only way to wash a large truck or SUV! The thick, froathy foam created by McKee's 37 Power Wash releases dirt and grime. McKee's 37 High Def Paint Sealant is a thick, creamy synthetic polymer formula that guards your vehicle's paintwork against the damaging effects of UV rays, road salt, bug splatter, water spots, acid rain, and environmental pollution while enhancing the depth and gloss. High Definition polymers form a catalytic bond to painted surfaces to provide long lasting protection, even during harsh winter weather where low temperatures and corrosive road salt are constantly trying to wreak havoc on your vehicle's delicate finish. Your vehicle's paint will have mile-deep reflections after using McKee's 37 High Def Paint Sealant. McKee's 37 FAST Interior Detailer is safe on leather, vinyl, rubber, plastic and LCD navigation screens. A quick spray and wipe is all you need to remove light dust that accumulates from day-to-day use. Your interior will look and feel as if you just spent hours cleaning it. Oh, and the fragrance -- it's to die for. I guarantee your vehicle's interior has NEVER smelled this good. There's only one type of fabric you want to dry your car: Microfiber! Microfiber is super soft, which prevents scratching during the drying process, and because it's so absorbent, you can dry a small vehicle with just one towel! The Waffle Weave Drying Towel makes short work of drying your vehicle so you won't have to deal with unsightly water spots. With a 75% polyester, 25% polyamide 100% split weave microfiber composition, this towel can absorb over 7 times its weight in water! The Green Monster Wash Mitt has everything you need in a wash mitt: it's super soft and it holds a lot of soapy water! Thousands of soft strands of fabric cover the outside of the mitt to trap dirt and pull it away from paint. This prevents debris from being rubbed back across your paint causing scratched and swirls. For comfort and ease of use, the Green Monster Wash Mitt features an elastic wrist band to keep it in place while you wash so you won't accidentally drop it. Wipe on McKee's 37 Interior Surface Protectant with one of these absorbent, nonabrasive foam pads. The foam is a high quality, closed cell variety that resists drips and smears as it applies products evenly. Total retail value of $185.89. You save $35.90!